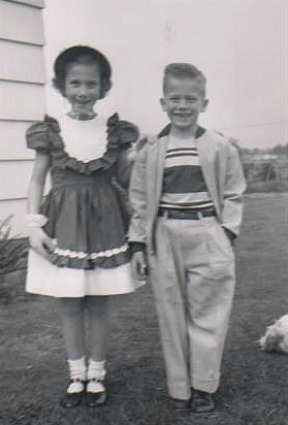 David and me, all dressed up for Mother’s Day in 1952. Happiness reigns supreme with me (hmmm, that is a phrase my mother used to use…see what happens when you write a family history?) now that I have proofed Growing Up yet again and sent the final version to Susan Wells to put in book format. I made some additions, thanks to grade school classmate Lana Blomgren Miller sending me her memories of the effects of Portland’s 1948 Vanport Flood on her family. The Blomgrens’ home was on the Columbia River so they personally had a front row seat to view this catastrophic flood. Now you can read Lana’s eye-witness account in the book, too! Yes, there is a chapter on the Vanport Flood, because G.I. Joe’s was located in the Columbia floodplain, so it is a part of the store’s history, as well. In the photo, I think a part of our dog appears in the right side. This entry was posted in Uncategorized and tagged Book designer, Vanport Flood. Bookmark the permalink.